CAN’T GET TO THE GYM – NO PROBLEM !! Let’s face it, going to the gym can be bit of a hassle & time consuming in today’s modern hectic lifestyle. That’s why you will love our PREMIUM GRADE RESISTANCE BANDS. These are ideal for men and women of all ages, we have three premium stretch bands to suite all fitness levels; LIGHT – MEDIUM – HEAVY, so you can do your own Home Workout wherever you are and whenever you want. IF YOU ENJOYED YOUR WORKOUTS, YOU’D DO THEM MORE OFTEN ! 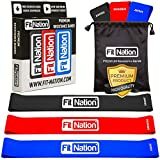 Fit Nation® Resistance bands exercise bands are great fun and you can work-out wherever or whenever you want – and that’s why you’ll workout more often. Plus – our Premium Resistance Bands offer a much more consistent tension on your muscles, which not only makes them a great alternative to weights but a brilliant injury rehabilitation tool too! VERSATILE – Select the grade that you feel most comfortable with from Light, Medium or Heavy or simply work up through the grades until you find your comfort zone. You can work all muscles throughout your body progressively and safely and then you can work back down the grades as a warm down exercise. For the more experienced users – you can use multiple bands together to get that ideal home or office workout. PREMIUM GRADE RESISTANCE BANDS – Made from Eco Friendly Natural Latex – these Bands measure 30cm x 5cm and the three band set comes professionally packaged with an instruction leaflet and with a free pocket sized carry bag, so you can easily take the bands with you wherever you go – so achieving your personal fitness goals has never been easier! Plus our ONLINE videos and e-guides are just a click away. SO GO ON – GET FIT – OR SIMPLY TONE UP – You know it makes sense !! CLICK the BUY Button and experience the FIT-NATION EXPERIENCE. At Fit-Nation, we know how important our relationship is with you, so we’ll only provide you with best product and service, or your money back! WHY ONLY 3 BANDS – Well after research and feedback from our customers – these are the 3 bands that are regularly used – so why pay for more than you really need ! Over 94% of our customers rate our fitness bands as 4 or 5 stars, and we think that tells the story. So why do customers rate our resistance bands so highly? It’s simple…because they really are that good! NEED WE SAY MORE ?? CLICK THE “ADD TO BASKET” BUTTON AT THE TOP OF THE PAGE AND UPGRADE YOUR FITNESS EXPERIENCE TODAY!